When you read the title you must think I am totally weird. Well, I am a bit. But when I found this online, posted by a friend on FaceBook, I just had to share. For one, it's very cute (don't you think!?). And it is so true! I must print it out and hang it on my wall. Hopefully it will inspire you too. Have a great day my friends and enjoy the view! Haha that is adorable! 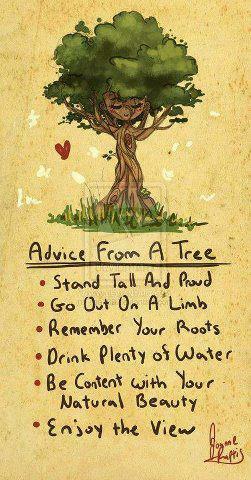 Guess there is a reason trees are often portrayed as the wise ones in movies/books! haha I saw the commentluv you left on my blog and I was like 'wait, what??' but it makes sense now. this is supercute and true, thanks for sharing!